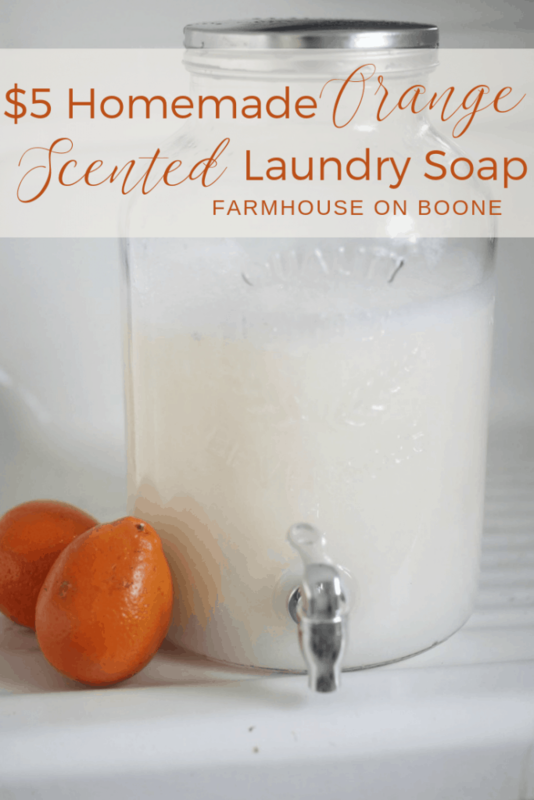 Learn how to make homemade orange scented laundry soap with all natural ingredients for under 5 dollars. Post contains affiliate links which means I make a small commission at no cost to you. I want to reintroduce you to my sister Laura from Our Oily House. 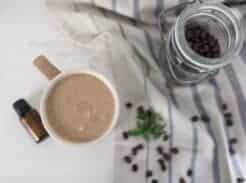 She shared with us a few weeks ago a tutorial for how to make All Natural Organic Cocoa Lip Balm. 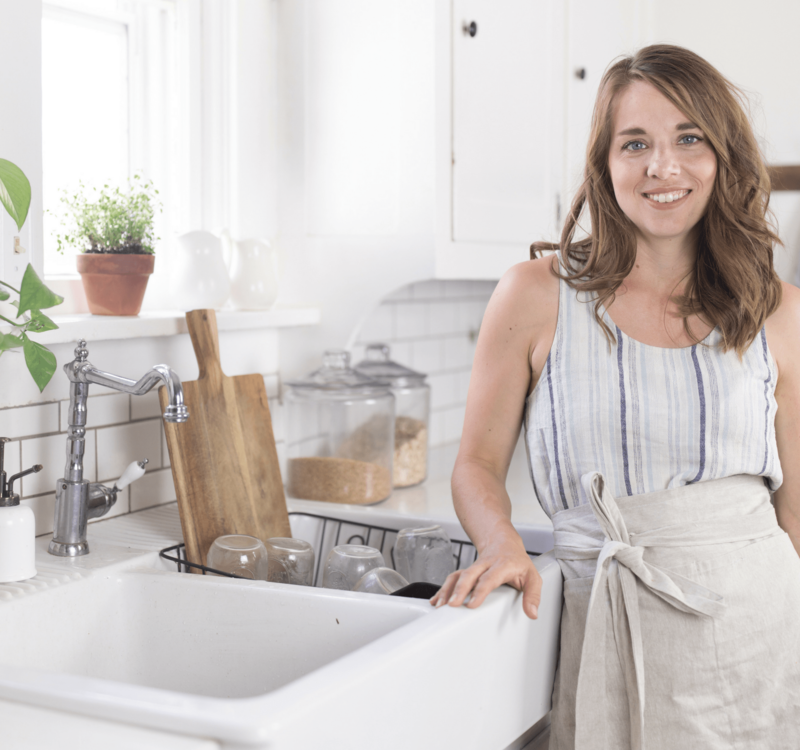 Today she is back with another DIY recipe that you can use to keep your clothes clean, without all the junk. 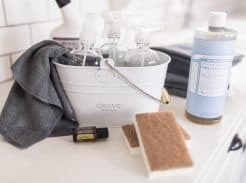 I will let Laura take over, as she shares how to make homemade laundry soap. I try to make most of my household products, mostly to cut down on toxins entering the body. The other bonus is it saves us lots of money! 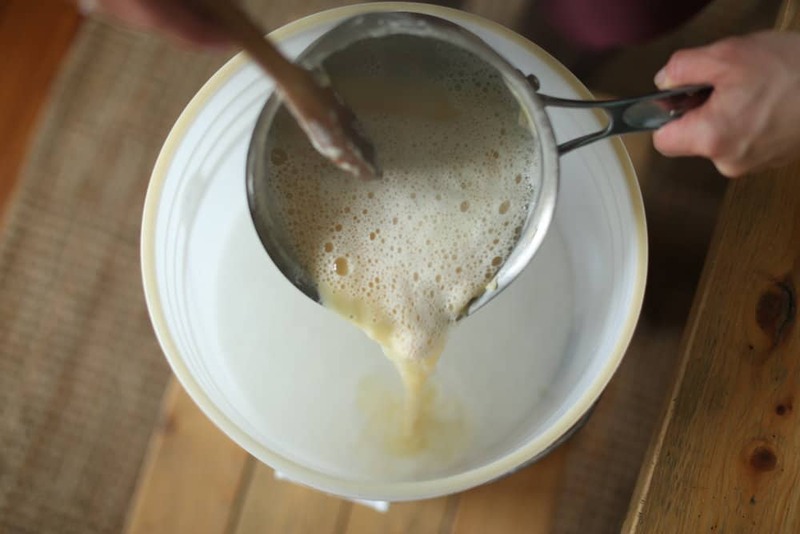 Making laundry soap is super easy, and very inexpensive! I make a 5 gallon bucket that lasts my family five months (I do a load everyday) and it cost under $5! 1. 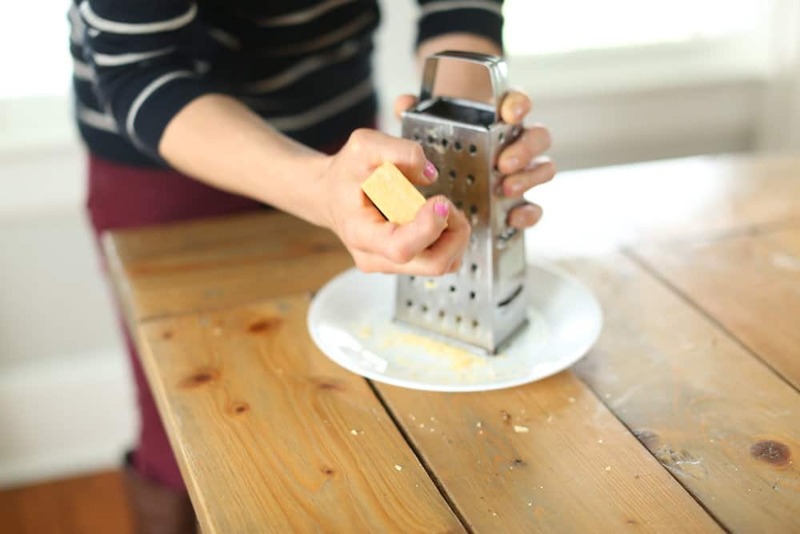 Shred a 5 ounce bar of Fels Naptha Soap with a cheese grater. 2. Put the soap in a saucepan with 2 cups of water, over medium heat, and stir constantly, until the soap is all melted. 3. Fill the five gallon bucket 1/2 way with water. Add 1/2 cup Washing Soda, 1 cup Borax, and your melted soap water mixture. 4. Give it a stir, and fill the rest of the bucket with water. 5. Add essential oils for scent. My favorite is Wild Orange! I do 25-30 drops for a 5 gallon bucket. 6. Let it sit overnight with the lid on. In the morning give it a good shake, or stir to mix well. Stirring it with a drill paint mixer attachment, or an immersion blender, really helps to get the clumps out! I use 1/2 cup per load in my HE washer, so it lasts a VERY long time. 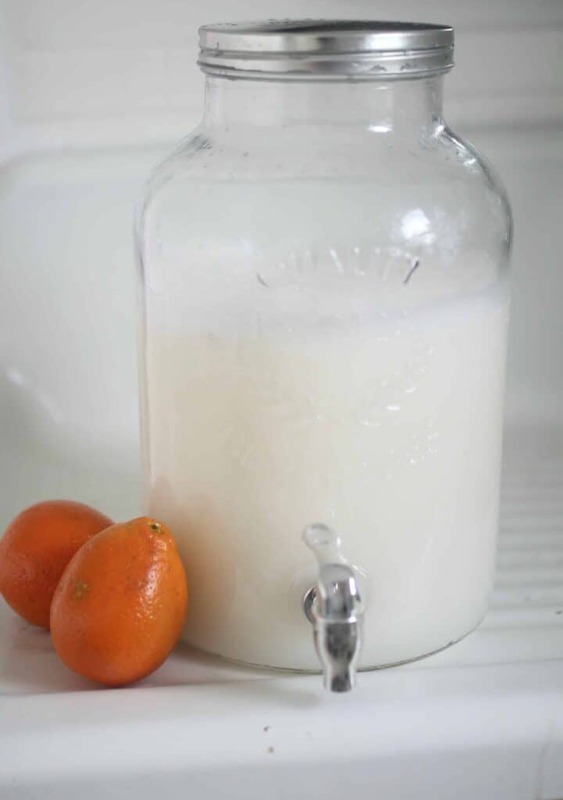 Making laundry soap is quick and easy! You can feel good about using this soap, as it is made out of all natural ingredients, and works very well. How many bars of Fels Naptha is in this recipe for a 5 gallon bucket??? You inspired me to try this again! Has been awhile since I did! In the recipe you said 5 oz soap but here you said 14 oz. Which one is correct? Is it a 14oz bar or 5oz bar per 5 gallon bucket? I don’t want to get overloaded with soap bubbles!!! 5 ounce bar. So sorry that was a typo! Thinking of trying this! 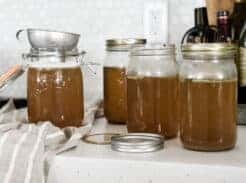 Do you put it in a glass jar with spigot, as pictured, and then leave the remainder in the 5-gal bucket for refills as needed? 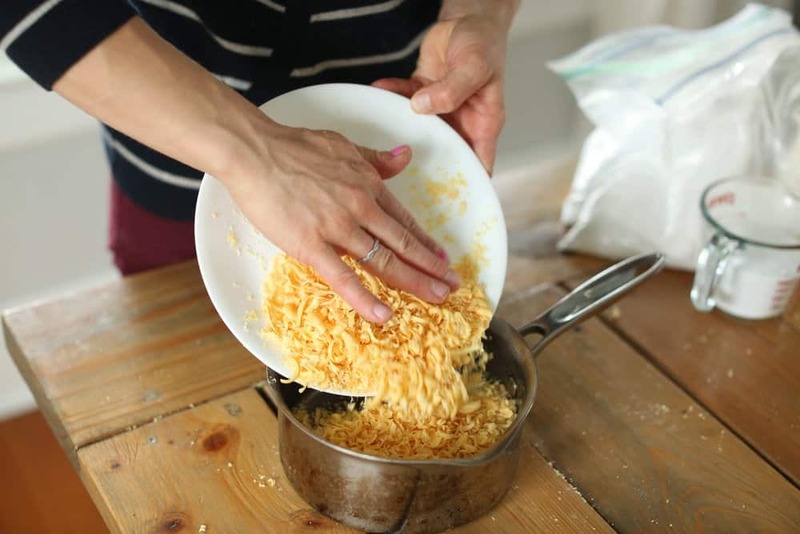 I did (I thought) everything as directed but ended up with the grated bar soap being chunky in the mixture.. what can I do to avoid this? Thanks! How much soap would you use for a regular washer vs an HE? The 1/2 cup is for an HE washer? So, 5 oz fels naptha, 1/2 C washing soda, 1 cup borax, 25-30 drops essential oils with 5 gallons of water? It’s a lower soap to water ratio than I have used previously. Thanks! HI Lisa, would any other soap do? I have grated soap (palm kernels) and wonder if I can use it here? Lisa, can you use a Dr. Bronner’s castille soap bar for this as well? They’re also 5 oz bars. Is this soap baby friendly? If not how could I adjust it to be? Is this the liquid detergent that you use for your cloth diapers too? I am going to make this very soon and I need to prep my newly purchased prefolds and inserts soon. Just wondering how you felt about the mixed reviews on borax being bad for you? I haven’t had time to do a ton of research but really love all your info and trust it! 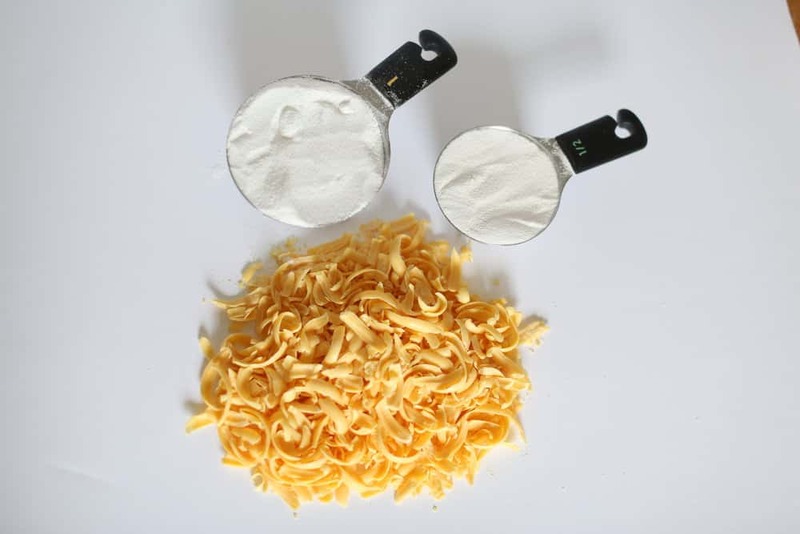 Can you use Dr. Bronner’s liquid castile soap instead of grating a bar? If so, how much liquid soap would you use to replace the 5 oz. bar? The Fels Naptha bar soap gets a C on EWG standards. This isn’t all natural, it uses chemical color dyes.